Today is my mother’s birthday. But I’ve never celebrated her birthday quite like I am today. This is her first birthday where she isn’t here. You see, she died last August and we buried half her ashes in a little cemetery in Cayucos, CA, near Morro Rock. The story of why my brothers and I only buried half her ashes there will be part of another story I will tell with my art going forward, or looking backwards I guess. This view from Highway 46 is one of my favorite places in California, if not one of my favorite views in the world. I did this oil on canvas a number of years ago, but now when I look at it I think of my mom, June. My mom wasn’t always an easy person to like, but I tried to love her just the same. And with her passing I’ve begun to think more and more about mortality, hers and mine. It’s like I can somehow keep her alive with my memories of her, even though there were plenty of times she pissed me off and I would love to forget certain things about her. But that’s not how it works when you are one of the keepers of family memories because memories are not always pleasant, and certainly not orderly, complete or revelations of great truths like they are in the movies. With her passing I am now the keeper of her stories and memories, but also the stories of her parents and grandparents and other relatives and people I never knew. Thank goodness I have plenty of black and white photos of my mom’s family from the 20’s and 30’s to help me with her early years and older generations. But there were so many people with hats, sensible shoes, billowing dresses and baggy pants lined up in front of mom’s house in East Los Angeles. I hope I can keep straight who was who because now my memories become my piece of immortality that my son (a fourth generation Californian on his dad’s side) will carry with him. Hopefully he won’t have too many memories of me that piss him off. 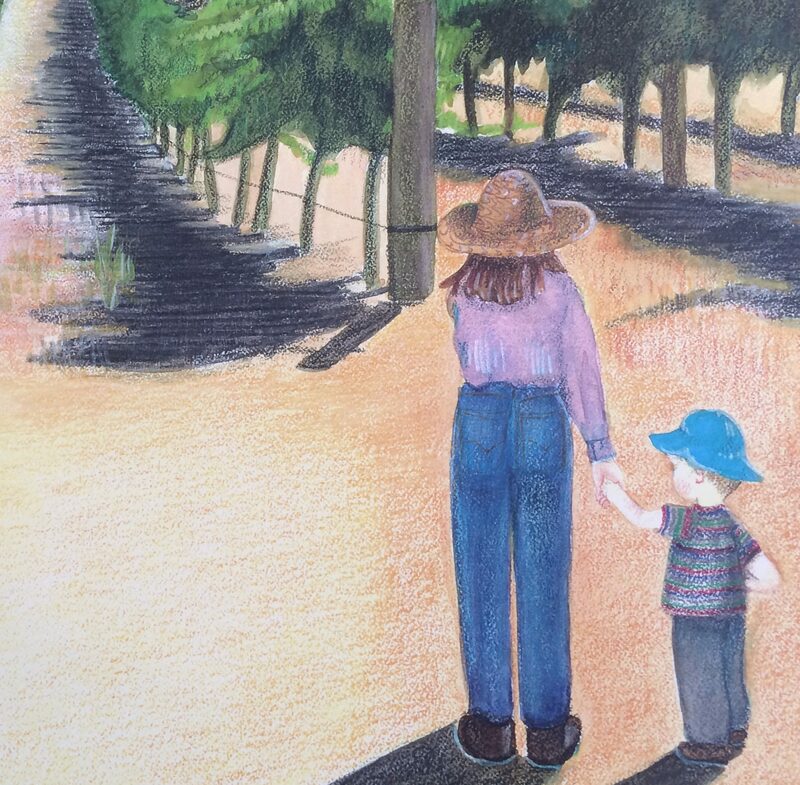 So, it is my hope to use my paintings and sketches of California to tell one white California girl’s story. It is also my hope that my art will show the beauty of this state and that my words won’t sound too self absorbed or whiny. Don’t know what piece of art I will post next time, or what story I will tell. It might be a watercolor I did from the Cayucos Cemetery where half of my mother’s ashes are next to all my dad’s ashes. Because now I am one of the keepers to both sides to my story.